GOOGLE MAPS This link shows the location of the turnoff to the campground from Dale Miller Rd. at the coordinates immediately above. I recorded the coordinates myself and checked them in Google Maps. If your GPS is like my Garmin RV 760 LMT it will try to send you to a spot about 1/4 mile south of there and instruct you to turn off to the wrong side of the road. 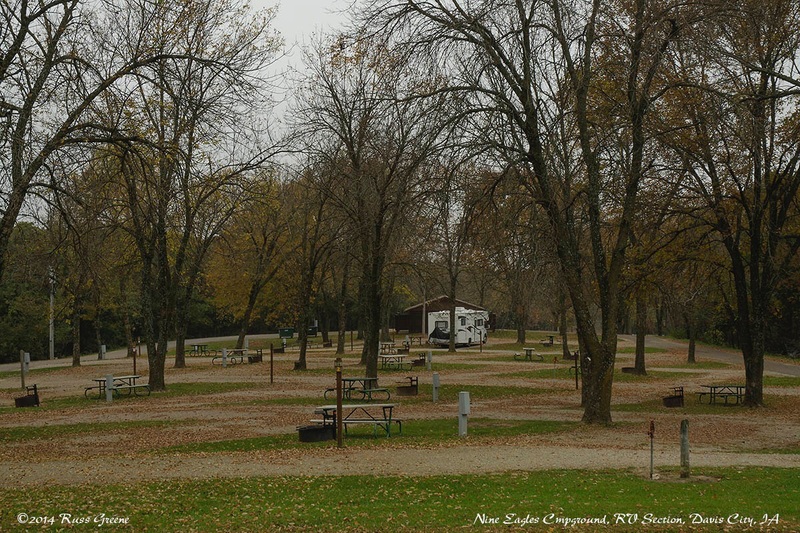 This is a view showing most of the RV section at Nine Eagles State Park, Davis City, IA. There are a few more campsites on the far side of the restroom/shower building behind my RV. Yep… I had the whole place to myself for a spell. PULL THRU: I’m going to say most of them are, if not all of them. See the campground map. 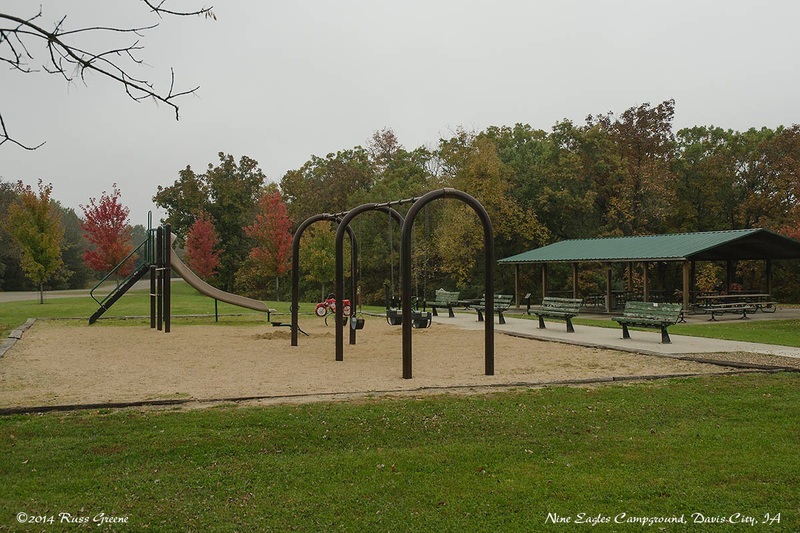 This is the play area and picnic shelter at the RV campground in Nine Eagles State Park. There is another play area down at the lake. Nine Eagles Lake has a play area for kids, a boat launch for rowboats and boats with electric motors. There’s also sheltered picnic area (not shown). The park has a cabin for rent maybe 50-100 yards from the lake shore. TOILETS: Flush toilets. One of the two stalls in the men’s room could not be locked, the door to the other would unlock and swing open if you pressed against the stall wall with your knee as you might when reaching for toilet paper. Stuff like this is inexcusable and disgraceful, IMHO, and the IA DNR should be thoroughly embarrassed by it. SOAP: Hand soap. Yay, IA DNR. You got this one right. The men’s was somewhat funky. You cannot adjust the water temp. It was OK in one of the three showers. In the other two it didn’t get warm enough. Showering here was not the most pleasant experience. In one shower, at least one of them, water backed up in the drain leaving you standing in an unsavory mixture of soapy water and brown floating brown gunk–YUK! The restroom and shower room were both in need of attention in the form of repairs, paint and cleanliness. You might prefer to shower in your RV. Propane: According to AllStays its the True Value Hardware in Creston, 46 miles to the NW or Ferrellgas, 48 miles to the south. Groceries: According to the AroundMe app there is Hy-Vee grocery in Lamoni which according to Waze is a 12 mile drive. I visited a couple Hy-Vee stores when I was in the Des Moines area and they were both substantial, true supermarkets as opposed to convenience stores. 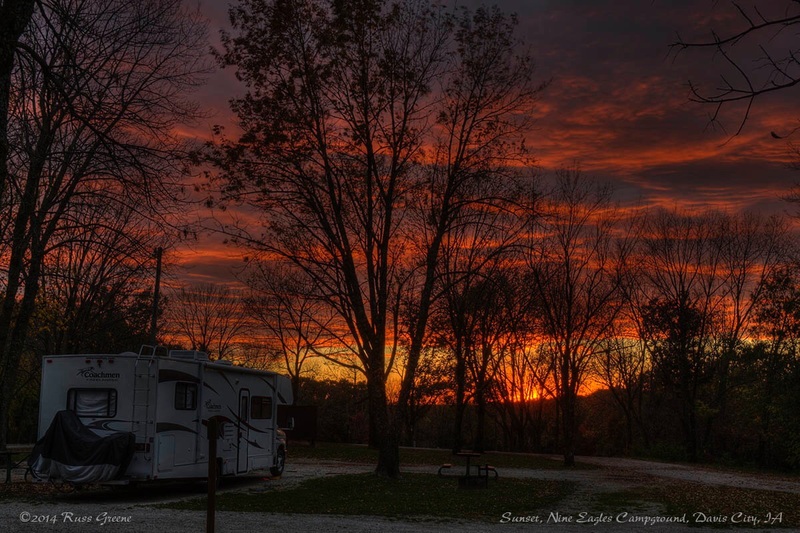 Nine Eagles campground in located in southern Iowa near both I-35 and the border with Missouri. I chose to say here on my way from Des Moines to Kansas City, MO because it would break up the trip and at $11 (late season rate) including electricity, dump station, garbage and showers included, it’s a relatively good deal. It’s a relatively remote location. You wouldn’t come to the area for shopping or nightlife. 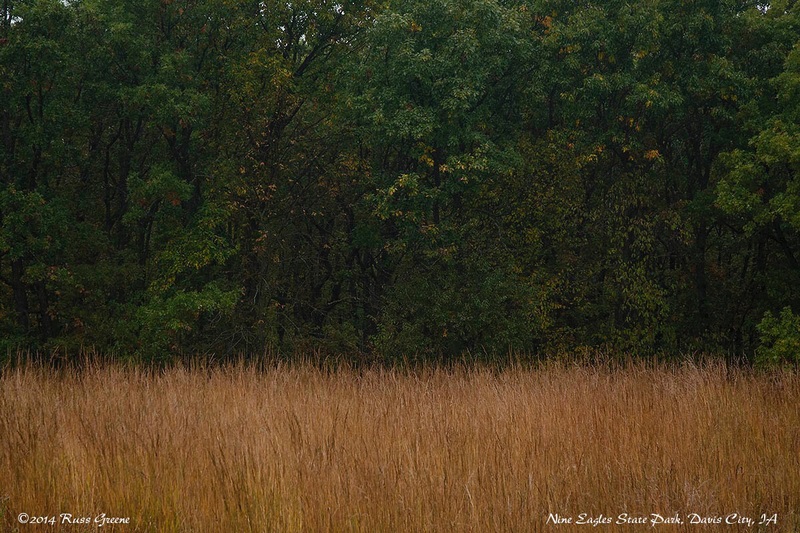 I thought this tall, reddish grass was really pretty and especially liked the contrast between it and the trees behind. 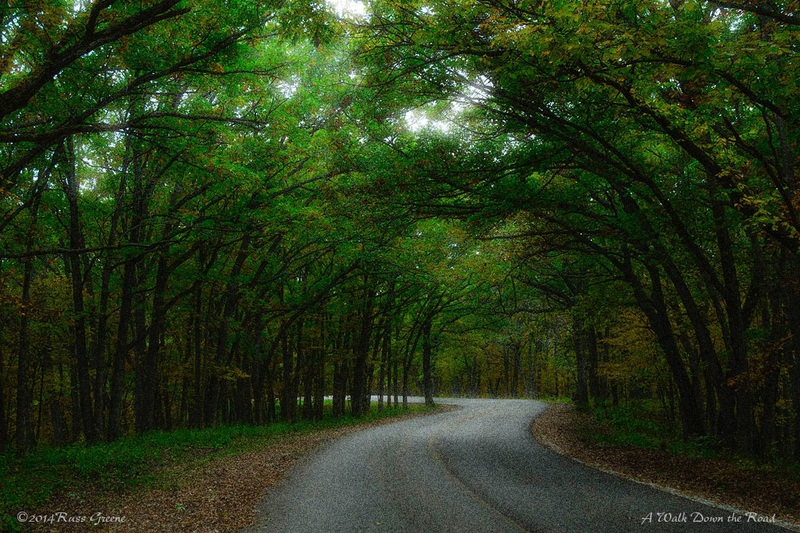 The campground is part of Nine Eagles Park State Park (see brochure at link above). Perhaps I should say campgrounds, plural, as there are three separate campgrounds: one for RVs with electrical hookups, one for tent camping and one for equestrian camping, the latter two without electricity. 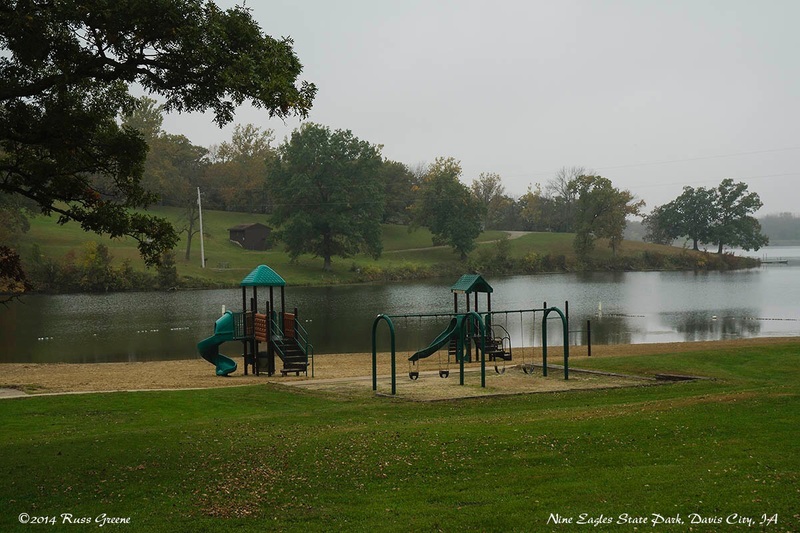 The park includes 67 acre Nine Eagles lake where people boat, swim and fish. There is a picnic shelter and boat ramp at the lake. Note that only rowboats and boats with electric motors are allowed. I presume canoes, paddle-boards and kayaks are OK too but there is no mention of these in the literature. There are also hiking trails, and in the winter cross-country skiing and snowmobiling. I was told by the campground host that after October 31 the campground is unhosted, there are no fees but the water is shut off. You can still get water up at the DNR office along the park entry road just outside the campground according to a DNR employee with whom I spoke. He also said that garbage service remains in effect plus electricity remains turned on. Essentially the campground is free with electricity and garbage after Oct. 31, but there are no showers or restrooms and water is available only at the DNR office. Of course, as winter approaches you need to watch the weather reports for snow. After one other party consisting of 3 RVs left the RV campground a short time after I arrived I quite literally had the campground to myself for the rest of the day and the next 2 days before a couple more rigs showed up. There is no road noise audible here. The area is heavily wooded and I enjoyed a walk along the road from the RV campground to the lake which I’m guessing is about 1.5 miles. Another day I hiked around Nine Eagles lake. With a few stops of 10-15 minutes each, including one where I spent my time figuring out how to cross the outlet stream (more on this in a moment), it was about 3 hours to complete the hike from the RV campground. The trail heads out right by the restrooms. I found rudimentary maps printed on 8 1/2 x 11″ paper at the sign-in board of the campground. They aren’t that great but definitely much better than none at all. The map seems not to include a number of trail junctions and one or two of the symbols on the map are not shown in the legend. As to the trail itself it was mostly easy to follow but it required a little thought and consulting the map at places as well as a little guesswork. I hiked the trail two days after a day it rained all day and the trail was quite wet and soggy. In places it required “3-step detours” off the trail around puddles or over streams. 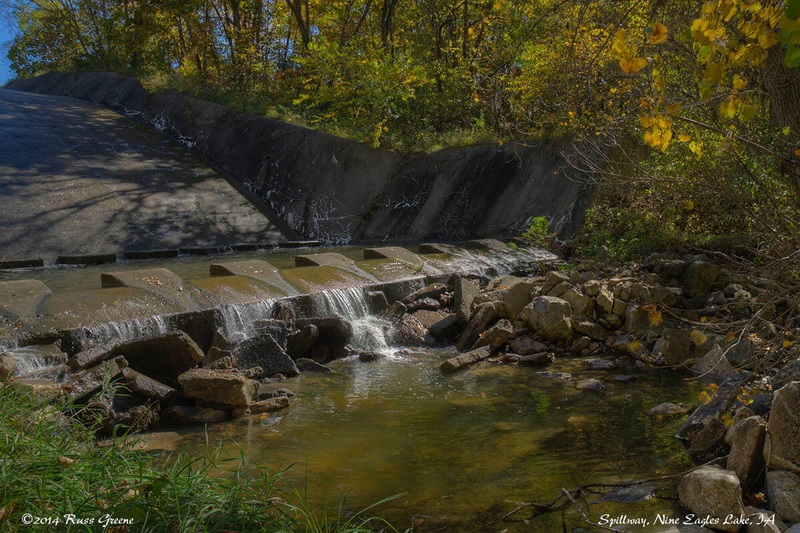 Hiking around Nine Eagles lake you will come to this spillway with no apparent way of getting across the stream. There is no foot bridge. At first I tried to pick a route over the rocks through the trees but it did not seem safe. I ended up hopping from one concrete protrusion of the spillway to the next which was quite doable. The big surprise on this hike was arriving at the spillway of the lake with no apparent way of getting across the outlet stream) see photo). I saw no bridge, no clear path. I attempted several routes over the rocks but the footing was not sound and tree branches made the going difficult, so I turned back on each of those attempts. Eventually I found that I could hop along the top of the concrete protrusions shown in the photo fairly easily. We are at Nine Eagles now. There is a brand new bathroom with showers but it isn’t open yet. :( We are just passing through our way home in Wisconsin. We are the only ones here. The water is turned off but the electricity works. We are in a Thor Vegas.